KATHMANDU, April 15: The ruling CPN (Maoist Center) has decided to run a door-to-door campaign from next week in all 744 local units to inform the voters about the party's accomplishments since it took the helm of government and the list of things it hopes to do if elected in the local polls slated for May 14. A meeting of the party held at prime minister's residence in Baluwatar on Friday has prepared a list of works it accomplished since its chairman Pushpa Kamal Dahal took reins of the government eight months ago. The meeting has also decided to make public the names of mayoral candidates on April 22 by organizing mass assemblies in all the local units across the country. The accomplishment list, which the party plans to make public next week, credits the party for sweeping political, social and economic reforms. The party has highlighted the announcement of the local-level elections and demarcation of the local boundaries as its most notable achievements. On Friday, the party also unveiled Maobadi Kendra ko upahar -- Gau Gau Ma Singha Durbar [Gift of the Maoist Center -- a Singha Durbar in every village] as its slogan for the local polls. Other achievements include registration of constitution amendment bill, formation of high courts, and elimination of power cuts in Kathmandu and Chitwan. Similarly, it has claimed that significant progress has been made in the national pride projects including the Kathmandu-Nijgad Fast Track and Postal Highway since it took charge of the government. The introduction of pension scheme for farmers and the decision to distribute additional Rs 500,000 victims of Maoist insurgency have also been listed as the government's key achievements. Though the main opposition UML and a section of foreign policy expert have been accusing the Maoist Center-led government of ignoring relationship with China to appease India, the party has claimed that it worked to maintain a balanced relationship with the country's southern and northern neighbors. “Nepal's relationship with India was at its historical low when our party took charge of the government. This government has mended ties with both the countries through numerous high-level visits,” CPN (Maoist Center) Sspokesperson Pampha Bhusal told Republica. She said that the projected 6.1 percent economic growth should also be seen as a major achievement of the government. 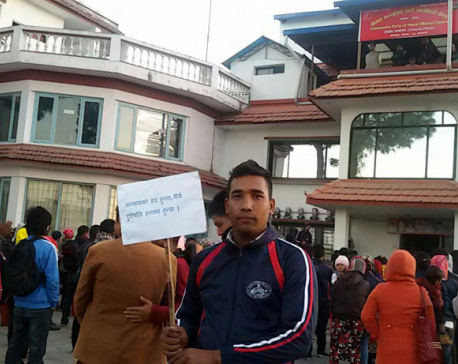 Contrary to the claims by the CPN (Maoist Center), the main opposition UML has been spearheading a campaign accusing the government of surrendering to India and completely ignoring relations with China. In the electoral rallies, UML leaders have been accusing Prime Minister Dahal of neglecting 'historic' agreements signed with China. “This government has ruined the relations with China. It hasn't done anything substantive to implement the historic agreements signed with China on areas of connectivity, railways and transit. The government has failed the people and the nation,” UML leader Bhim Prasad Acharya told Republica. Bhusal, however, dismissed the allegations. She said that the government has made considerable progress in the implementation of the agreements signed by previous KP Sharma Oli's government with China. “There has been considerable progress in increasing connectivity with China following the prime minister's visit to China last month. Works are in progress for developing rail networks with China and increasing connectivity between the two countries,” said Bhusal.